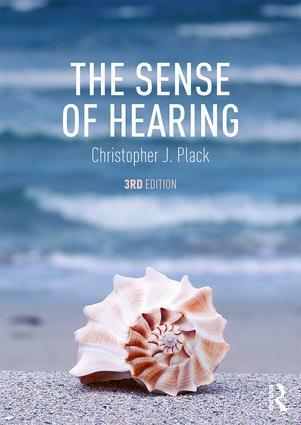 The Sense of Hearing is a truly accessible introduction to auditory perception that is intended for students approaching the subject for the first time, and as a foundation for more advanced study. The second edition has been thoroughly revised throughout, and included new chapters on music, hearing impairment, and a new appendix describing research methodologies. In clear and authoritative prose, the fundamental aspects of hearing are addressed. The reader is introduced to the nature of sound and the spectrum, and the anatomy and physiology of the auditory system. Basic auditory processes including frequency selectivity, loudness and pitch perception, temporal resolution, and sound localization are explained. The reader is led to an understanding of the remarkable abilities of the auditory system in a systematic and coherent way. In subsequent chapters, it is shown how complex processes, such as perceptual organization, speech perception, and music perception, are dependent on the initial analysis that occurs when sounds enter the ear. Finally, a chapter on hearing impairment provides an introduction to disorders of the auditory system. The text benefits from 162 original illustrations, including uncluttered diagrams that illuminate auditory mechanisms. An extensive glossary provides definitions of technical terms. The emphasis is on explanation and clarity of style throughout, making The Sense of Hearing an essential resource for students and educators involved in this sometimes challenging field. 1. Introduction. 2. The Nature of Sound. 3. Production, Propagation, and Processing. 4. A Journey Through the Auditory System. 5. Frequency Selectivity. 6. Loudness and Intensity Coding. 7. Pitch and Periodicity Coding. 8. Hearing Over Time. 9. Spatial Hearing. 10. The Auditory Scene. 11. Speech. 12. Music. 13. Hearing Impairment. 14. Concluding Remarks. Appendix: Researching the Ear. Glossary. Christopher J. Plack was educated at Christ’s College, University of Cambridge, where he obtained a BA in Natural Sciences in 1987 and a PhD in 1990. He worked as a postdoctoral research fellow for two years at the University of Minnesota and for two years at the University of Sussex before being awarded a Royal Society University Research Fellowship in 1994. He moved to the University of Essex in 1998 and was promoted to chair in 2001. He moved again to Lancaster University in 2005 before obtaining his present position of Ellis Llwyd Jones Professor of Audiology at the University of Manchester in 2008. Chris Plack has published over 70 peer-reviewed journal articles, 12 book chapters, and two edited volumes. In 2003, he was elected a Fellow of the Acoustical Society of America.